If you have teens who have already taken secular history courses in school, then The Light and the Glory will introduce them to a different viewpoint for studying early American history. It tells the stories of famous men in our country's early history, including in those stories the often-ignored influence of God in their lives. This is the history that most of us never learned! Although this is an adult book, it's very readable for teens. You might follow this book with the sequel From Sea to Shining Sea, which covers the period from the Constitutional Convention up to pre-Civil War times. The book is available on audio CDs or MP3 for those who prefer to listen. 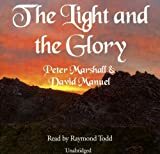 Peter Marshall and David Manuel's popular book The Light and the Glory has been rewritten for children by Anna Wilson Fishel. She has added narratives, study questions, and a glossary to make it even more useful. For those unfamiliar with the original, the theme is the providential founding of America and the spiritual significance of our country's history. The book is actually written toward an audience of children ages nine through twelve.